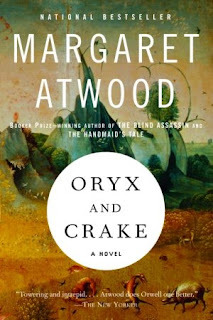 I just finished the novel Oryx and Crake by Margaret Atwood. Not being familiar with her I work I had no idea she delved into the world of science fiction. Unlike my post about Ursula K. LeGuin’s form of science-fiction writing, Margaret Atwood actually takes the genre as most do, not using it as a vehicle to take you on the journey, but using the genre to propel you into the future to show how the wrongs that we are committing today will effect us tomorrow. In the story Jimmy aka Snowman leads us through the tale of civilizations ultimate collapse from a society obsessed with beauty and youth that will do anything to obtain it. Gene splicing, Internet addiction and mass media are some of the common themes related to humanities utter demise. Jimmy is obsessed with learning old words that he discovers in archaic paper bound books that have yet to be replaced with digital copies from the Universities library. Throughout the novel these words, which he repeats like a mantra, give Jimmy a form solace of being the only remaining human alive.